Barton Essex Entrance Gate - Blamphayne Sawmills Ltd. Fully planed finish with a choice of soft or hard wood. 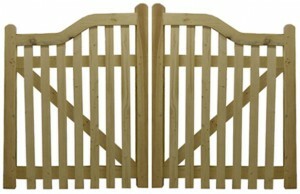 A robust gate which offers beauty and character to an entrance way. Its stylish ‘wave’ top rail is ideally suited to pairs. Top rail and hanging stiles both measure 4” x 3” and the pales measure 70mm x 21mm. Softwood will be pressure treated with Tanalith E in a natural wood green.